"The leadership of Óglaigh na hÉireann sends New Year greetings to our friends and supporters at home and abroad. We send best wishes, especially to republican prisoners and their families. We commend all those working for the early release of those prisoners and urge them to continue in their efforts. "We remain committed to our republican objectives and we support all those, especially our comrades in Sinn Féin, working for those goals. "Over the past twelve months republicans have celebrated and commemorated with dignity and pride, the lives and sacrifices of those who died on Hunger Strikes. "On this the 50th anniversary of the deaths, on active service, of our comrades Seán Sabhat and Fergal O’Hanlon we remember their sacrifice and that of all those comrades who fought or died during the Border Campaign. "We remain firmly committed to our objective of a free, united and independent Irish republic. We believe that our political objectives can now be achieved by political means and we will continue to pursue this course with energy in the year ahead. "We salute the commitment and discipline of IRA Volunteers and that of the republican activist base. The determination and unity that have sustained us all thus far are required now more than ever. "There are big challenges to be faced in the time ahead, republicans will not shy away from these challenges. We are very conscious that progress requires everyone to take risks. "A heavy responsibility rests on political leaders to make politics work so that conflict remains firmly in the past. We have demonstrated our commitment to this approach. We urge all others to do the same." "Gabhann ceannasaíocht Óglaigh na hÉireann beannachtaí na hathbhliana lenár gcairde agus lenár lucht tacaíochta in Éireann agus i gcéin. 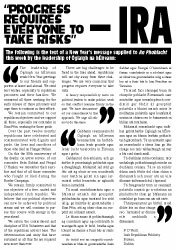 "Gabhaimid deá-mhianta, ach go áiríthe le priosúnaigh poblachta agus a dteaghlaigh. Molaimid iad siúd go léir atá ag obair ar son scaoileadh saor luath na gcimí sin agus iarraimid orthú leansteán ar aghaidh lená n-iarrachtaí. Tá muid comhthiománta agus a bhíomar aríamh dár gcuspóirí poblachtacha agus tacaímid leo siúd uilig, go háirithe ár gcomradaithe i Sinn Féin, atá ag obair chun na cuspóirí sin a bhaint amach. "Le bliain anuas tá poblachtanaigh ag cuimhniú agus ag ceiliúradh le maorgacht agus le bród, beatha agus íobairt na daoine a fuair bás ar stailc ocrais. "Ar ócáid seo an caogadú cuimhneachán ar bhás ár gcomradaithe Seán Sabhat agus Feargal O’hAnnluain ar fianas, cuimhnímís ar a n-íobairt agus ar íobairt na gcomradaithe uilig a sheas leo nó a fuair bás le linn Feachtas an Teorainn. "Tá muid faoi cheangal buan de chuspóir poblacht Éireannach saor aontaithe agus neamhspleach creidimid gur féidir ár gcuspóirí polaitúla a bhaint amach anois le modhanna polaitúla agus leanfaimid orainn sa chúrsa seo le fuinneamh sa bhlian atá romhainn. "Molaimid seasmhacht agus rialbhas gníomhaithe Óglaigh na hÉireann agus an bhonn leathán poblachtach gníomhach. Tá an aontacht agus an seasmhacht a sheas linn go léir chuige seo noís tabhachtaigh ná mar a bhi siad ríamh anall. "Tá dushlann móra romhainn, níor umhalaigh poblachtanaigh roimhe na dushlann céanna. Tá se an soiléir dúinn nach féidir dul chun chinn a dhéanamh ach nuair atá an uile dhuinne toilteanach dul i bpriacal. "Tá freagreacht trom ar ceannairí polaitúla cinntiú go n-oibríonn an pholaitíocht chun go bhfanann an coimhlint go buan san am atá caite. 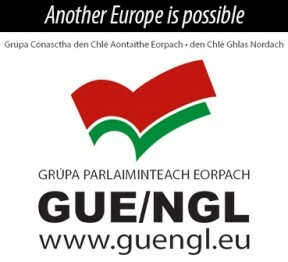 "Tháispeanamar go bhfuil muid dlúite leis an chur chuige seo. Iarraimid ar dhoine eile amhlaidh a dhéanamh."